In this long-awaited sequel to THE SS BROTHERHOOD OF THE BELL, alternative history and science researcher Joseph P. Farrell examines what the two biggest secret projects of World War II had in common. Rejecting the nonsense that has become associated with both projects, and documenting his case solely from scientific sources, newly discovered declassified War Department documents, and eyewitness testimonies, Farrell maintains that both projects originated in careful consideration of Einstein's celebrated and now discarded Unified Field Theory. American and German wartime scientists and engineers determined that, while the theory was incomplete, it could nevertheless be engineered. 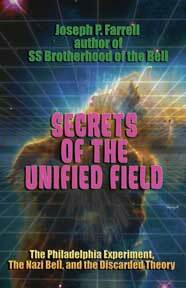 SECRETS OF THE UNIFIED FIELD: The Philadelphia Experiment, the Nazi Bell, and the Discarded Theory. By Joseph P.Farrell. 340 pages, 6x9 Paperback, Illustrated, and Bibliography. Chapters include: The Meanings of "Torsion"; Wringing an Aluminum Can; The Mistake in Unified Field Theories and Their Discarding by Contemporary Physics; A Little-Known Hungarian Genius and the Forgotten Verification: Gabriel Kron and Einstein's Unified Field Theory; Three Routes to the Doomsday Weapon: Quantum Potential, Torsion, and Vortices; One Theory, Many Technical Applications; A Consideration of the Practical Research Plans to be Pursued in the Philadelphia Experiment and the Bell's Projekt Kronos; The Corum Proof of Concept Experiment: The Importance of Unanticipated Non-Linear Effects; The Conceptual History of the Philadelphia Experiment According to the Corums and Daum; Tesla's Meeting with FDR; Arnold Sommerfeld and Electromagnetic Radar Stealth; Magnetic Permeabilities of Two Media; Electromagnetic Phase Conjugations, Phase Conjugate Mirrors, and Templates; The Unified Field Theory, the Torsion Tensor, and Igor Witkowski's Idea of the Plasma Focus; Rationalizations for the Presence of Radioactive Elements in Compound Solution with Mercury in "Xerum 525," and for the Use of Ultra-High Speed Mechanical Rotation in the Bell; tons more.